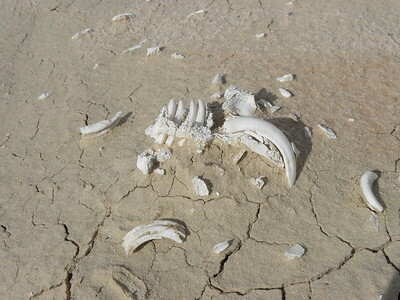 The Willandra Lakes Region is a geologically unique area of dry lakebeds rich in fossils. Globally it is important for its very early homo sapiens findings. They include the world's oldest cremation site (26,000 years old) and remains of settlement up to 40,000 years ago (agricultural use, stone tools). It is the most important site in Australia to observe the period when the giant marsupials became extinct and the human race became dominant. The WHS covers 7 former lakes in 2,400 square kilometres. The lakes dried out about 15,000 years ago. High winds on the exposed lake floors formed large clay dunes, lunettes, which are rare in the world. This is a rarely visited WHS among our community (only 5 were there before me), but the park sees a remarkable 80,000 visitors a year. I had always thought that it is pretty remote, but it actually lies within reach for a weekend trip from Adelaide or Melbourne. You can drive out there yourself - it is 90km on an unpaved road, but the surface is not bad (unless it is raining, but then it will be closed). 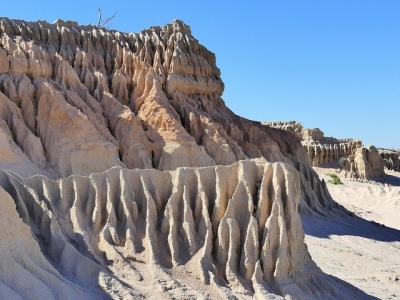 I opted for a day tour to Mungo National Park by minibus from Mildura. Lake Mungo is one of the Willandra Lakes. After having been out there for a full day, I can only recommend a visit to this precious place. The semi-arid desert with its specific plants, the marvellous colours of the dunes (nicknamed the Walls of China), the fossilized treetrunks and bones that are exposed each day by erosion, the views over the vast former lakes. To put an end to the trampling of the ground, the core area where the fossils are found is now only accessible with an official guide. Our guide, Graham Clarke from Harry Nanya Tours, proved to be excellent. He knows everything about the place, its ecology and the paleontological discourse surrounding the 40,000 year old Mungo homo sapiens skeletons. On the way back we were fortunate to see a group of young wild emu up close. They are very curious, and came to the side of the road to have a good look at us. In the same area I saw two hopping kangooroos, also a rare sight (the most commonly visible kangooroos in Australia are those killed on the road). I visited this WHS in January 2018. Since I had read positive reviews on Harry Nanya Tours and reading that a 4WD is more suitable to visit Mungo National Park, I booked way ahead to secure a spot on the afternoon and sunset tour. Communication was swift and I received a booking confirmation shortly after. A few months after I double checked and was told not to worry but to simply confirm my arrival at Mildura the day before or on the day. Having many other bookings to confirm, I left it at that. While on the road in Australia, our initial plan was to stop at a motel in Bordertown after visiting the Naracoorte Caves NP. However, on the way, luckily we listened to an announcement on national radio stating that most places were going to be on shutdown the next day due to a catastrophic fire alert. Meltwaterfalls' past experience in the US came to mind so I decided to double check my booking with Harry Nanya Tours before driving any further and possibly for nothing. The call immediately diverted to voicemail countless times and when double checking the contact number on the internet, I learned that Harry Nanya was seriously ill since a couple of months and apparently the tour company does not exist anymore. Already feeling that this was going to be a near miss, I decided to call the Mungo National Park Visitor Centre to see whether or not they would be closed. Surprisingly, a very kind ranger answered the phone and explained that Mungo National Park would always be closed if they were to follow the bush fire alerts as it is far more than 36 degrees practically all the time. He went out of his way to give us helpful advice on how to reach the visitor centre safely even though we didn't have a 4WD vehicle and told us he would be there in the morning to show us around the walls of china area. With that in mind, we decided to cancel our hotel in Bordertown and book an extra night in Mildura instead. That meant a lot of driving in one day but we were willing to go for it. The next day we brought a packed lunch and plenty of water with us, filled up our rental car tank with fuel and after breakfast we headed straight towards Mungo National Park from Mildura. The first stretch is on a deteriorating asphalt/gravel road almost till the first sign proudly displaying UNESCO inscription on the WH list (some 33km away from the visitor centre). Lots of wallabies, kangaroos, rabbits, mice and foxes cross the roads early in the morning but by 9am they seek refuge under the few trees or shrubs and bushes. The last 33km are on a sandy unpaved road which is doable without a 4WD on a sunny day and if you drive carefully but close to impossible if conditions are wet. Visiting on one of the hottest days on record for practically all Australian states, we had no major problem reaching the visitor centre. The only sign of human life for this circa 4 hr return journey from Mildura is the Mungo Lodge which serves as a resting/lunch stop for most tours. One of its fields is also used as an airstrip for scenic flights over Mungo NP (195 dollars per person). The park ranger suggested to head straight to the Walls of China lunette and later visit the visitor centre when the day gets hotter. We were the only souls around. We were shown several Aboriginal remains and baked sediments from eroded fireplaces, exposed fossils, fossilised tree trunks, and huge lunettes which were once part of the Willandra Lakes basins. Walking in a sort of naturally eroding canyon with distinctly coloured eroded pinnacles (photo) was the highlight of our trip and made all our efforts to visit this site worth our while. The pink soils at the base of the lunette formed between 120,000 and 100,000 years ago, during a dry period. The brownish cream and white sands formed between 60,000 and 37,000 years ago, a period during which the lakes where full. The grey clays which cap the residual pinnacles formed some 37,000 to 18,000 years ago, a period during which the lakes filled and dried out several times. Beyond the main lunette, we visited white dune crests which have formed since the lakes finally dried out some 15,000 years ago. From afar we spotted the Lake Mungo lunette, the burial place of the Mungo lady and Mungo man, believed to be ancient Aboriginal custodians who cared for this land some 40,000 years ago. The site is still being excavated. Willandra Lakes were inscribed on the WH list because they contain human bones, tools, shells and animal bones that provide some of the oldest evidence of modern humans (Homo sapiens sapiens) in the world. Moreover, the relatively undisturbed landforms and sediments are living records of events which took place in the Pleistocene Epoch. About 31,000 years ago, it is believed that the Earth's north-south axis moved 120 degrees from its present position and returned again over several thousands of years. The ranger was happy to give us a lot of free time to roam around and take photos after his explanations. We then read the information boards inside the visitor centre, watched the very informative video (recommended), and walked a short part of the 35km lakebed loop (which can be done by mountain bike). There is a bronze UNESCO inscription plaque next to the visitor centre entrance. The interactive mungo mobile app served as a useful smartphone guide to the rest of the park especially around the 'meeting place'. Noticing a lot of different bird species, I walked towards the few dead trees and red dunes and was surprised to find a small source of water packed with wild emus and kangaroos. Moreover, there were several bird species, the most noteworthy of which was Major Mitchell's cockatoo. It was a lovely way to end our visit at one of Australia's top off-the-beaten track WHS. The Mungo National Park is best visited from Mildura that has flight connections to Melbourne and other state capitals. The road however is unsealed, and we had to rent, on top of our campervan, another vehicle, a WD, just to drive to the parks visitors center.We were there in October during the dry season so the gravel and sand tracks were pretty ok.There is no entrance fee, however, a small amont has to be put in an envelop at the center.Then you place the receipt under the windshield of your car and the adventure can start. Mungo was a Woolshed in the 18th century, the original buildings are still there.Driving across a dried out lakebed, you soon reach the socalled 'Wall of China' with different layers of geological units in distinctive colours, ranging from pink to grey to brown.There are Rosewood trees, Sugarwood, Bluebush and Eucalypt trees.Mobile Sand dunes that moves with the winds. We have seen curious Emus and shy Red Kangaroos and some Ringneck parrots. The track now follows the ridge that divides Lake Mungo from Lake Leaghur.People were living in this area about 60,000 years ago.Traces of Aboriginal occupation was found and is well documented in the small museum of the visitors center. Late Pleistocene: The presence of settlements of Homo Sapiens Sapiens is attested to in the Lake Mungo region from ca.-40,000 years. Dubbed as another WHS: Shores of the Willandra Lake system are known as "The Walls of China"